4 Bedroom Terraced House For Sale in Milton Keynes for Offers in excess of £335,000. 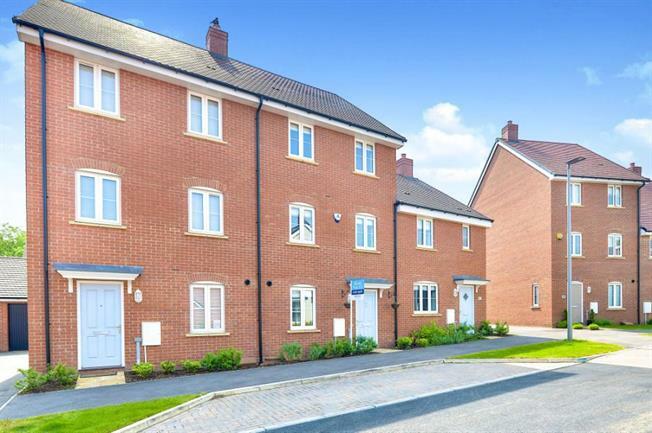 Presented in impeccable condition throughout, this four bedroom townhouse located in the popular development of Newton Leys. Situated on a quiet residential street within walking distance to the lake, shops and schools. The accommodation comprises; entrance hall with polished white tiles and under floor heating, kitchen/diner with bespoke fitted units and fully integrated appliances , spacious lounge with French doors leading to the rear garden, downstairs cloakroom, four bedrooms, en-suite to master bedroom, en-suite shower room to second bedroom and a family bathroom. Outside there is secure rear garden with a small patio, a single garage and driveway providing off-road parking for two vehicles. This property has been enhanced substantially since new and offers a much greater specification of internal fixtures and fittings. Tiled with underfloor heating, doors leading to kitchen, lounge and WC also a storage cupboard. Window to front. White cabinets with a grey roll top work surface. Integrated appliances (fridge/freezer, dishwaher, washing machine, stainless steel double oven, hob and oven. Tiled floor with under floor heating. Low level WC, hand wash basin. Tiled to chest hight, tiled flooring with under floor heating. Carpeted, two windows to front. There is a garden that is mainly laid to lawn with a patio area. The rear of garden has access to the garage and parking area where there is space for 2 cars.